Has your baby suddenly turned into a toddler overnight? Looking for a toy that promotes learning and laughter at the same time? Keep reading and we’ll point you in the right direction. Plenty of options for educational gifts are available. Taking a closer look, you’ll realize that a variety of toys can help your child develop a different set of competencies. If you take into consideration skill levels, durability, and quality — then add technology to the mix — looking for the best toddler learning toys can be overwhelming. Let’s discuss the things to consider when shopping for an educational toy. 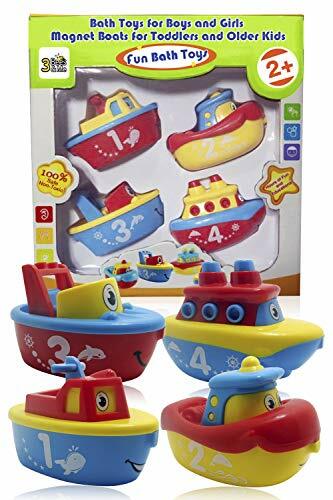 I’ll then share with you my selection of the best educational toys for toddlers. Use the links above to check the latest prices or read our in-depth educational toddler toy reviews below. Where do you start when selecting an educational toy for your child? What are the things we need and which ones are to be avoided? Your 1-year-old may already have started to experiment and sort objects (source). Selecting toys designed to enhance these skills should set up your little one for success. Their cognitive skills are developing at a rapid pace, including the ability to solve simple trial-and-error scenarios, and puzzles are a great way to encourage them. At this age, toddlers are interacting more with parents, friends, and siblings. Some toys will teach your toddler to take turns while playing or to pass toys back and forth between players (source). Now is the time to introduce basic manners, sharing, and friendly gestures. Furthermore, toddlers start voicing — sometimes loudly — their opinions. Communicating with your child through play encourages speech development. The more talking you do, the better. Last but not least, the motor skills they began developing as a baby will be enhanced through play. You’ll see an improvement in their coordination and ability to handle and control various shapes and sizes of objects. Toddlers tend to grab and throw anything they can reach. Anything. For 2-year-olds, choosing a sturdy toy able to withstand their professional throwing skills will be the key. Our little ones also tend to make a snack out of every little piece they find. Small parts of low-quality toys can easily come off and become dangerous if swallowed. 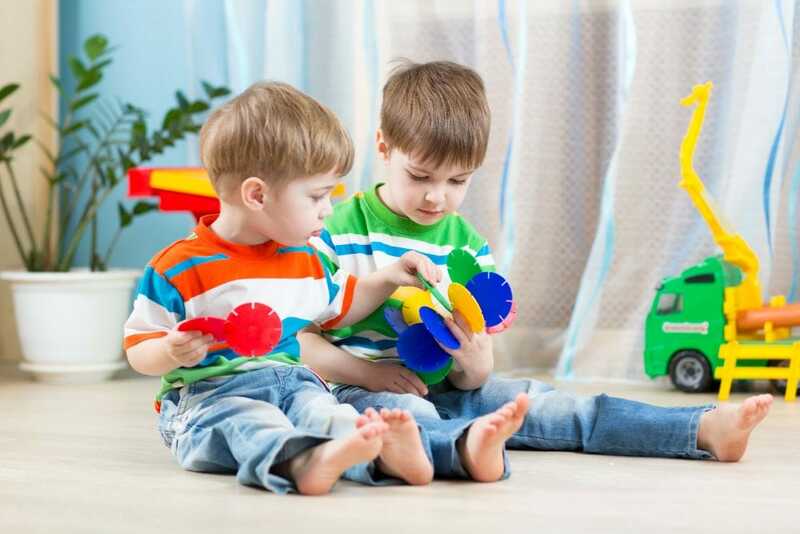 When purchasing an educational toy for your toddler, make sure to consider these factors. Many chemicals still found in toys today are proven to be harmful to children and babies’ brain development. The best toddler learning toys should be free of BPA, phthalates, and heavy metals, such as cadmium, lead or mercury. Learning toys for toddlers can introduce them to new technologies from a young age. Some parents might decide to stick to a more traditional approach with toys such as blocks or cubes. Others may decide to allow their little one access to technology through toys. There’s no right or wrong here: it’s really a matter of preference. Many options are specially adapted for toddlers. They combine fun and interactive learning through technologies, such as tablets, phones, or laptop-shaped educational toys. You’ll see a few of these on our list. Educational toys are so beneficial — playing and learning at the same time. Whether you’re looking for a more traditional toy or a tech gadget for your little one, here is my selection of the best educational toys for toddlers. Maybe your child is showing interest in building but isn’t quite ready for grown-up wooden building blocks? This toy could be one to consider. 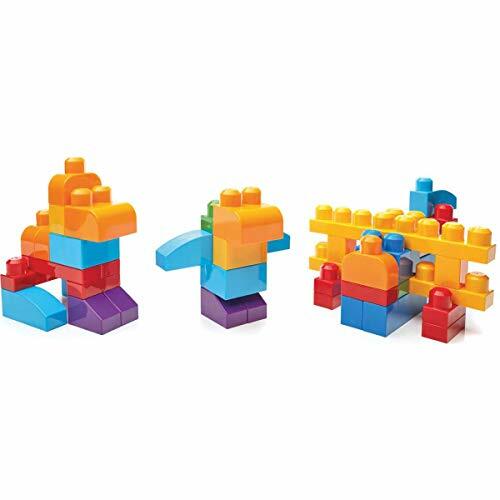 When you’re on the go, these 80 colorful mega building blocks are packaged in a convenient bag, ideal for travel. They come in different sizes, all shaped to fit small hands, and suitable for 12 months and older. Your child might be kept busy for a while, building towers with matching or mismatching colors, fine-tuning important motor skills. With this toy, when it comes to creativity, the sky’s the limit. This classic option stands the test of time. Maybe your toddler has graduated from the plastic option and you’re looking for something more complex? This popular toy introduces older toddlers to construction and engineering. You shouldn’t have to upgrade this toy anytime soon as it will keep them entertained for a few years down the line. 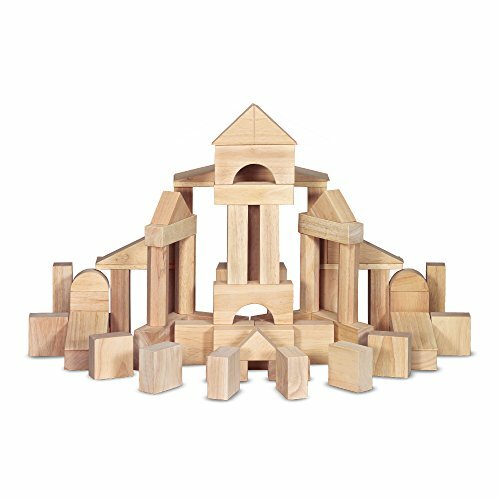 The 60 solid wood blocks teach your child patience and coordination. Blocks can be precisely stacked up one on top of the other, encouraging creativity, and developing motor and problem-solving skills. The best reward after the hard work? Knocking them down before putting them all away. An included wooden box allows easy storage and makes sure no block gets lost before any upcoming playdates. Is your little one getting bored of the baby cloth book and needing an upgrade? This interactive book is designed to keep your young toddler entertained and stimulated during story time. Teaching your child fine motor skills, the six thick pages are easy to turn. Sensory and language skills are being developed through colorful piano keys, flashing lights, 40 different songs, and phrases. This book comes with volume control for quiet time, or when you’re on the go. It’s also made of sturdy plastic material, which will be able to withstand throws and rough use during exciting moments. This choo-choo train is great for kids aged 18 months to 3 years. It can be pushed and pulled with ease. As your child grows, the 23 pieces can be assembled and disassembled, becoming one of the first construction toys your child might own. 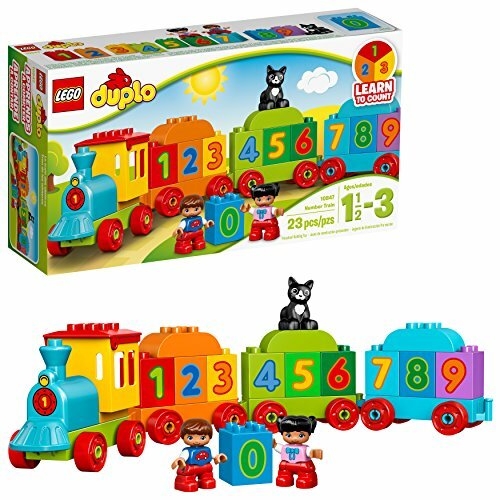 The locomotive and the three wagons contain numbered bricks — from zero to nine — teaching your child numbers and simple mathematics. Two Lego Duplo characters and a kitty will enhance your child’s imagination and aid in storytelling. Conceived with your child’s safety in mind, the size of the bricks is perfect for small hands to grab and play with. 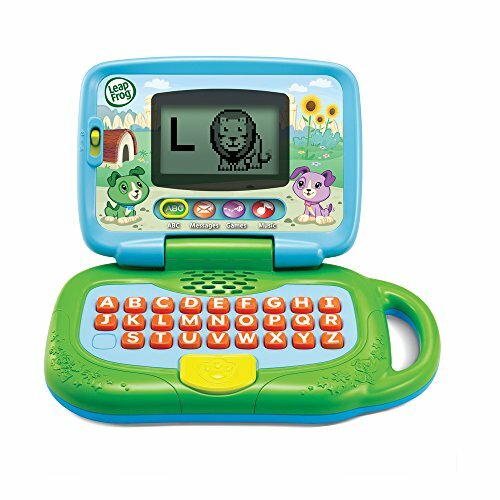 Suitable for both little girls and boys — 2-year-olds and over — the LeapFrog laptop comes in a green and pink version. The side handle makes it easy to carry around when work needs to be done. Just like mom and dad. 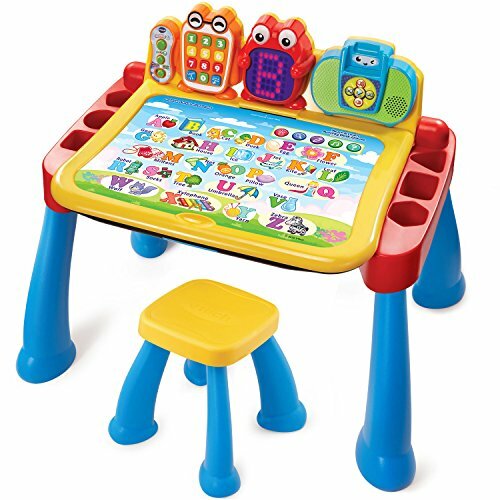 This toy is ideal for role play and imitating busy parents working on their laptop. The large screen is easy to read and has four different modes. From alphabet learning to games and music — even a pretend emailing function. This toy has a lot to teach. To make it even more personalized, the Leaptop can be customized with your little one’s name, to teach them how to spell. Another LeapFrog product, this toy is composed of fridge magnet letters, which can be placed on your fridge or any other magnetic surface. The 26 magnetic tiles can be combined to form words, developing your child’s alphabet skills. When in need, the magnetic frog bus helps your child identify the different magnetic letters. Simply place the letter inside the bus and press the music key. The friendly bus will then pronounce the letter, and say a word associated with it. 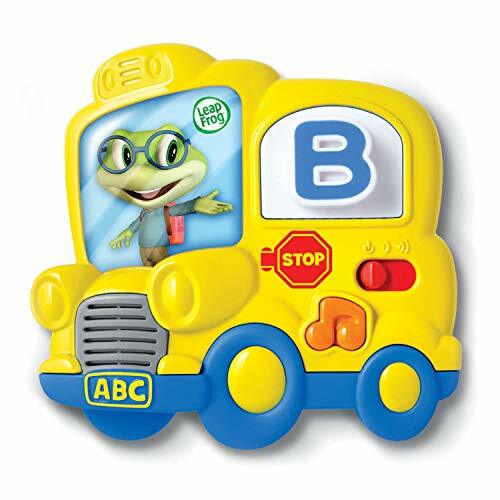 To complete the learning process, the magnetic frog bus can even sing the alphabet song, encouraging your tot to join. 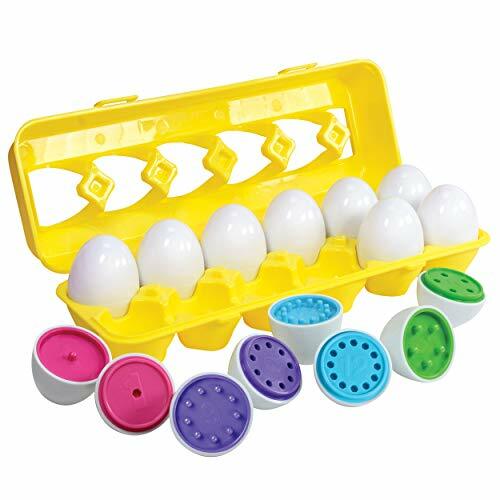 This color-matching egg set, for children aged 18 months and older, teaches fine motor skills and creates imaginary play and stories. Toddlers will do just like mom and dad, cracking and splitting eggs into two parts. Each egg reveals a different color and contains different matching holes and pins to put them back together. This set doesn’t only teach colors and role play, it also educates them on matching colors and numbers, while improving their dexterity. It comes in a sturdy plastic case to put the eggs away when the fun is over. 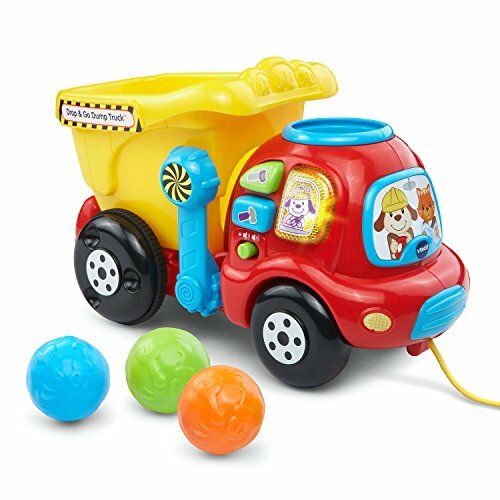 Trucks seem to be one of the most popular toys for toddlers, so why not select one that’s educational too? Large buttons on the side of the truck teach your child songs, sentences, and the names of the tools used during play. Colorful rounded rocks can be placed on the truck’s head, rolling down to the rear bucket. Once in the bucket, unload the truck and your child is ready to start all over again! As your little one grows up, a string allows the truck to speed up as it’s being pulled around the house. This sweet toy is designed to improve social and motor skills. Made for two players, your child will be able to share the picnic with a parent or another guest. This will help teach your toddler the notion of sharing and socializing. From filling cups and using forks to placing fruits and sandwiches on plates, this toy improves your little one’s hand dexterity. 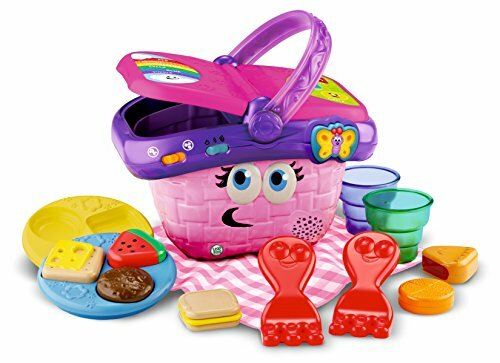 If they need a little help with role-play, this picnic basket can pronounce 30 audio responses, introducing colors and shapes. When the lunch is over, all items can be packed neatly away in the picnic basket. Too young to own a real desk, but old enough for a fun and interactive option? Containing several activities and multi-functional, it should be quite a while before your toddler gets bored with this desk. It includes melodies and a light-up display. Five interactive pages can be placed on the desk, teaching music, numbers, letters, fruits, colors, the human body, and more. Cards come with four different learning modes, and as the child grows, additional pages can be purchased to increase the challenge. Let the artistic side take over — a chalkboard appears by flipping the lid of the desk open. If the artist is more of a crayon type of person, a paper can be clipped over the chalkboard for colorful creations. This realistic toy is a good option for older toddlers and comes in a choice of two different colors. The 73-piece cash register set includes an assortment of bills and coins. 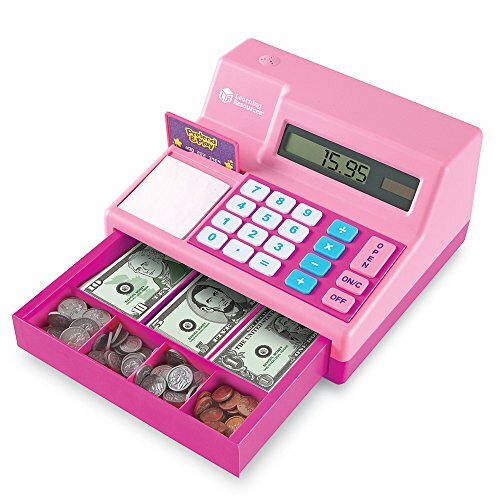 Much more than just pretend play, the cash register includes a solar-powered calculator. Children can pretend to swipe credit cards and punch in prices before the cash register opens, making that standard cash register sound. This would be a great toy to teach your little one about currency and counting. The oversized buttons are suitable for small hands, making the transactions easy. We can see why this toy is an award-winning item. 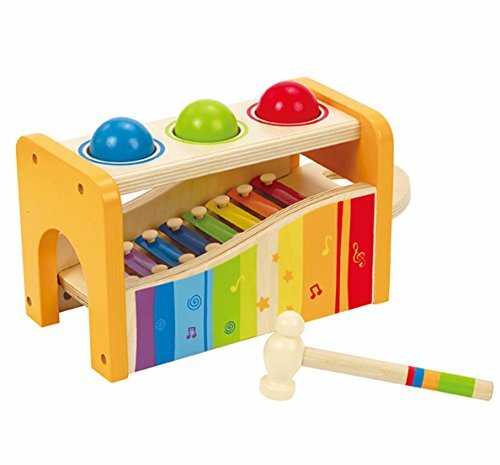 The xylophone has been designed to induce learning throughout. It helps develop motor skills, such as dexterity, along with logic, critical thinking, and hand-eye coordination. Suitable starting for even a 1-year-old, toddlers will enjoy pounding on the three colorful balls to produce sounds. When pounding fun is over, separate the xylophone to play individual notes. It also makes it easier to transport and carry around. With rounded edges and non-toxic water-based paint, this sturdy wooden toy is also safe for children. Not to mention, it’s an attractive design. Hammer away! Suitable from 2 years old, this tablet comes in black or a stylish pink color. 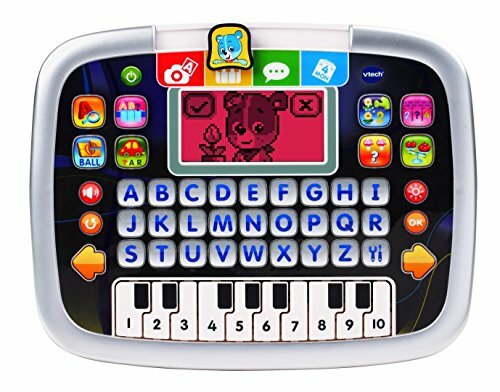 It includes a keypad, piano notes, four educational games, and eight progressive learning activities — spelling, counting, simple mathematics, reading, and more. This tablet encourages pretend play, imitating parents and older siblings. An imaginary camera and calendar should keep your tot engaged for some time. The sturdy design can also withstand most shocks and drops. Parents will be happy knowing that this toy comes with volume control, and when inactive, it automatically shuts off, saving that precious battery power. Three progressive learning stages mean this smart chair will grow with your little one, increasing the challenge as they get older. You choose the required age range by just sliding a switch. 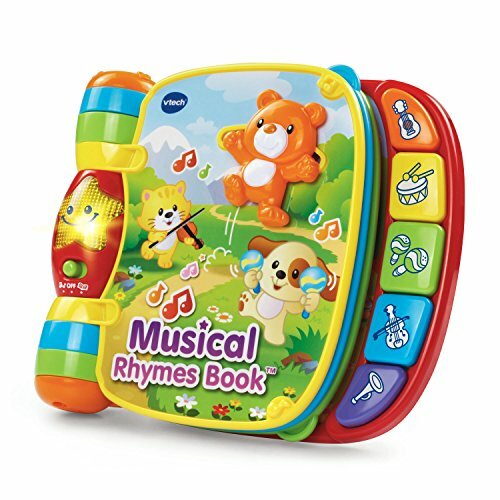 It produces over 50 songs and sentences, encouraging your toddler to stand-up, move, and dance. The included interactive book will take the fun further, encouraging children to find specific items, hidden in the small storage area under the seat. 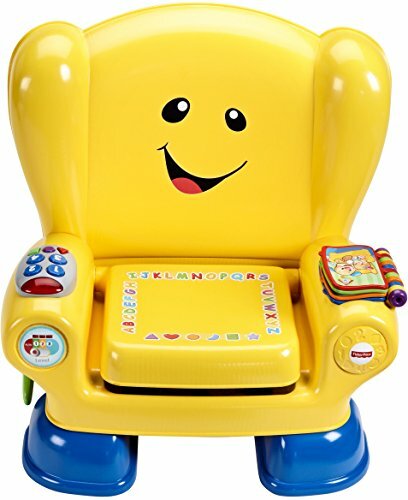 This chair can be much more than a toy. Used as a regular chair for everyday use, it also functions as a little hiding place for special toys. Kids who enjoy a challenge will love this fishing game. It’s composed of six wooden magnetic fish and two fishing rods. The game can be played alone when parents are busy, or along with a fisherman friend, encouraging social and communication skills. This toy isn’t only fun and exciting, it also teaches your child numbers and colors. A wheel points out which fish number and color to look for, promoting the development of problem-solving and fine motor skills. If your little one isn’t interested in fishing, the company promises to make it right, with a 100 percent happiness guarantee. Is your baby or toddler fond of singing? This microphone isn’t only for pretend play — it amplifies your child’s voice for a real singing experience. It comes in either blue or pink and is suitable from 3 months up. 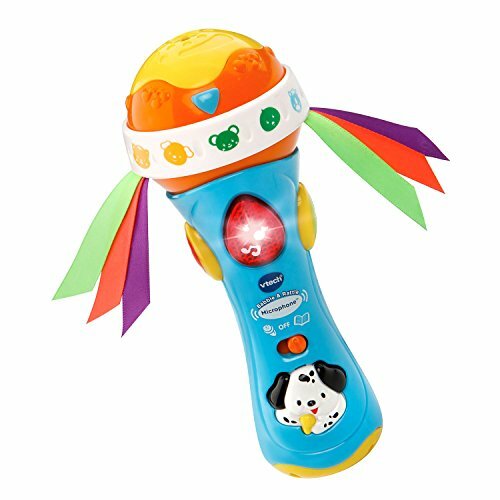 Activated by a puppy button, the microphone can sing over 60 songs and phrases, encouraging your toddler to join in. From rock’n’roll to classical songs, it also features different animal sounds to encourage your baby’s hearing and language skills. Set the stage, we’ve got an entertainer ready to perform. Visiting the doctor is no fun, but playing doctor is a whole different story. 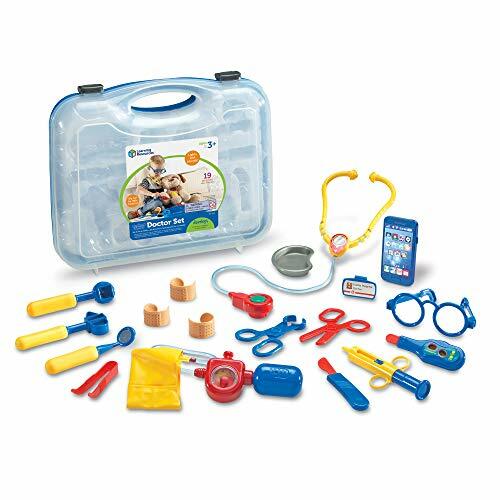 To make it even more realistic, this toy set even comes with a pair of doctor glasses. With its 19 pieces — bandages, name tag, forceps, scalpel, syringe, and more — this doctor kit might generate a future vocation. A phone can be used to stimulate imaginary play and book important check-ups, with lights and sounds adding to the fun. A battery-powered stethoscope allows your little doctor to check the patient’s heartbeat. With all the equipment fitting inside a translucent case, your toddler will quickly be on the go to take care of their patients. These floating bath toys come in a set of four. Built-in magnets allow the numbered boats — from one to four — to line-up in order. They don’t only make bath time fun and exciting, they also teach little ones colors and numbers. Concerned about your child’s safety? The bath toys are free of phthalates and BPA. They’re made with durable material to make them last a bath lifetime. Rounded shapes with no sharp edges, they won’t hurt or scratch your child’s delicate skin. Their small size is perfect for a toddler’s hands. They can easily be dried after bathtime, for the fun to continue on dry land. This fun and interactive robot might soon become your child’s best friend. Combining learning and dance moves, this little robot sings and dances in rhythm. Large buttons located on its feet or tummy activate the music. 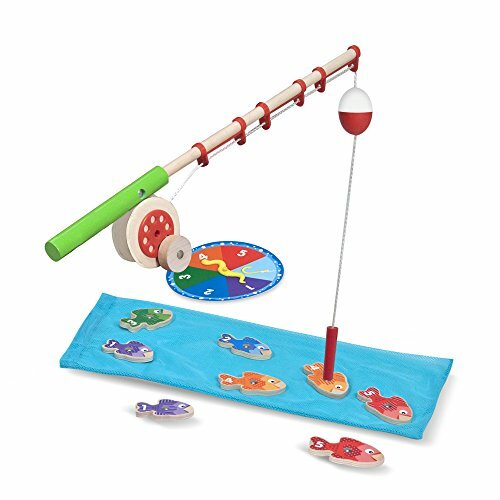 This toy encourages your little one to stand up and do the same, developing gross motor skills. 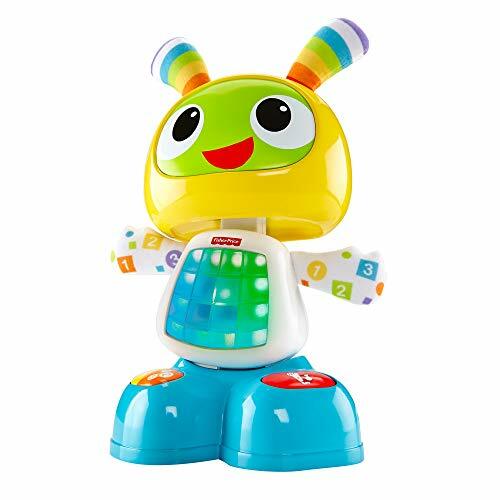 Beatbo the robot also teaches colors, numbers, and the alphabet. Songs can be easily personalized if you’d like to customize your child’s learning. Record a sentence, and Beatbo will remix it within a song. While considering skills along with your child’s interests, selecting the best educational toy for toddlers might not be easy. This guide should help you pick the best option (or two!) for your child. Our all-around favorite from the list is the Mega Bloks 80-piece set. It’s a classic option, without being heavy to hold and use, and should entertain a toddler into preschool age. I might even join the building party! Which educational toys have you purchased for your toddler? Which one was your child’s favorite? We’d love to hear from you; please leave a comment in the section below.